Cooking during a heat wave is a real pain in the arse. Queensland spent the weekend being baked to a crisp. The temperature in Brisbane crept up into the high 30s, although other parts of the state had it much worse. The bushfires on Stradbroke Island are still raging as a I type this; 60% of the island has burned and a smoky haze has swept over the city, turning the moon ripe orange. During the heat of Saturday our house was practically a sauna. And that was while we were sitting still – with the oven and stove-top on it would have been outrageous. Poor W had her afternoon nap drenched in sweat. Wisely, we ate lunch in an air-conditioned pub and then spent the afternoon at the pool. W went crazy for the water, kicking her little legs and laughing her little arse off at S and I diving and splashing around. As the afternoon wore on and we went home the heat stayed, but was joined by a wonderful breeze that we were able to enjoy from our vantage point up on the hill. We opened up the windows and let the cool(ish) air flow through the house. And we decided to cook a Middle Eastern feast. Because why not?! It’s hot in the Middle East, right. Plus I wanted to stay on theme with last week’s Persian-inspired cake. The dishes we cooked either came directly from, or were inspired by, the beautiful Jerusalem cookbook by Yotam Ottolenghi and Sami Tamimi. My mum gifted us the book soon after W was born, and while we haven’t cooked too many dishes out of it yet, everything we have cooked has been delicious. Besides which the book itself, with its fabric cover, storytelling, and historical tidbits, is a great read. We settled on a few complementary dishes that were taste-packed, but wouldn’t involve too much time spent sweating over a hot stove. I made hummus that we ate with fresh pita bread, roasted carrots drizzled with tahini sauce, and a chickpea tabbouleh with heirloom tomatoes and pink onion. S made herbed meatballs with broad beans. And for dessert? 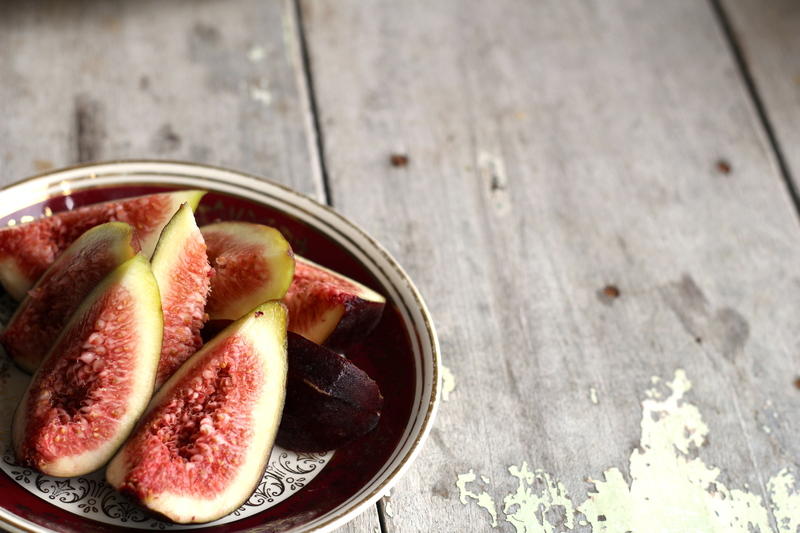 Fresh figs, is what! 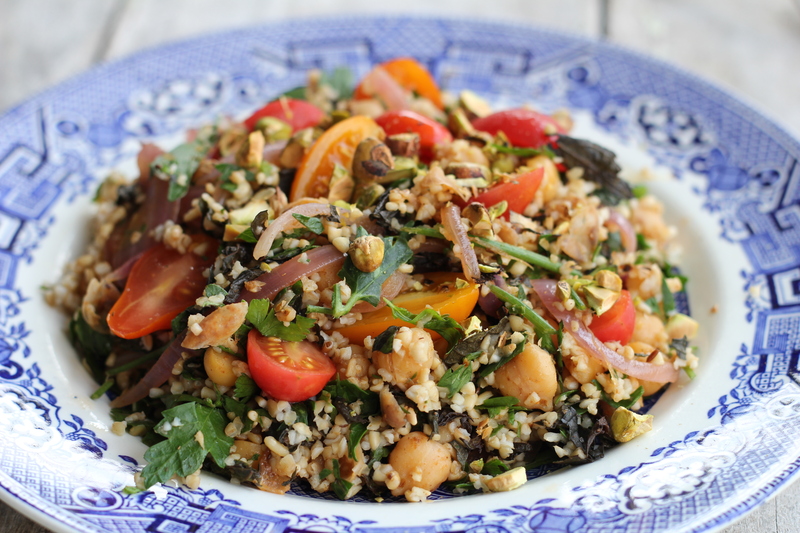 Below I’ve shared the recipe for the chickpea tabbouleh. 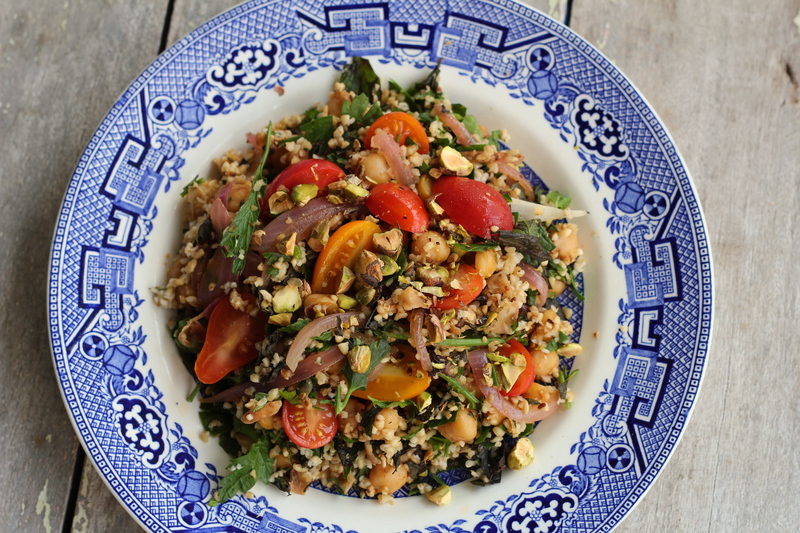 It’s a simple and refreshing salad that doesn’t require much cooking time, perfect for summer nights. 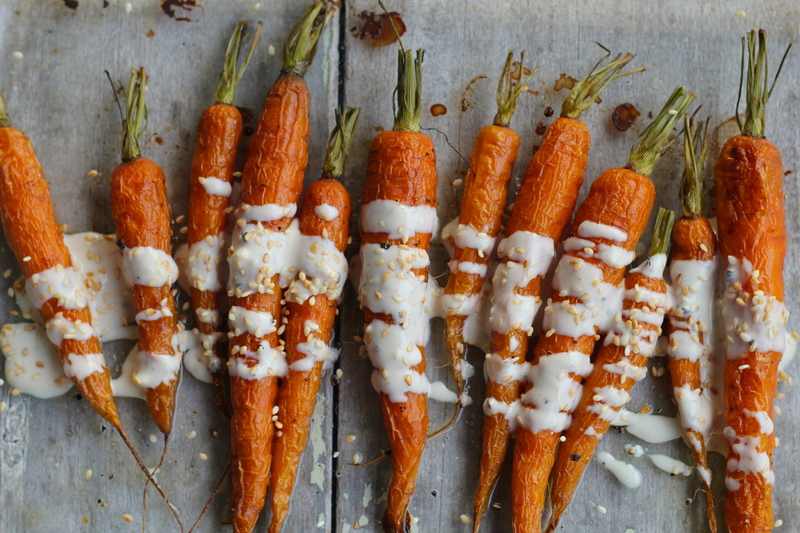 The hummus and carrot recipes I’ll share later in the week. Dry toast all 4 teaspoons of cumin seeds in a pan over a high heat, shaking the pan frequently until the seeds are fragrant. Leave to cool, then grind in a mortar & pestle. Combine chickpeas in a bowl with the juice of one lemon, crushed garlic, ground cumin, cayenne pepper, cardamom, paprika and honey. Stir to combine and leave to marinate for 1 – 2 hours. In the meantime, put the bourgal into a pot, pour over three cups of boiling water, cover tightly, and leave for 30 – 40 minutes. Drain, pop into a big bowl, and fluff with a fork. 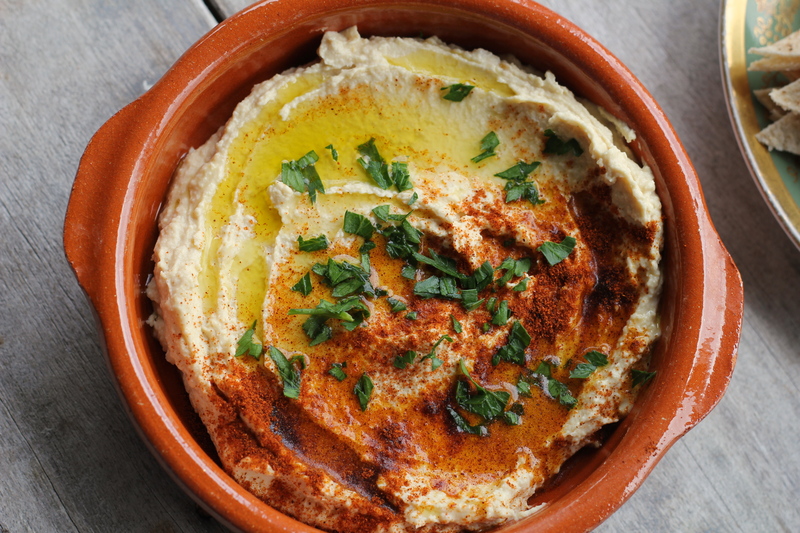 When the chickpeas are ready, finely slice the pink onion and cook in a heavy-bottomed pan over a medium heat with a splash of olive oil. Cook until tender, approx. 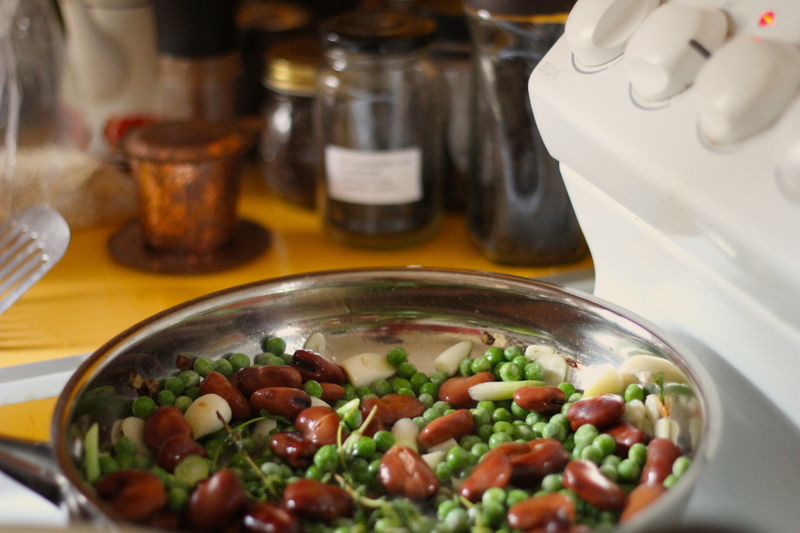 10 minutes, then add the marinating chickpeas along with their juices. Cook for a further ten minutes or until all the liquid is absorbed, stirring frequently. Remove from the stovetop and leave to cool slightly. 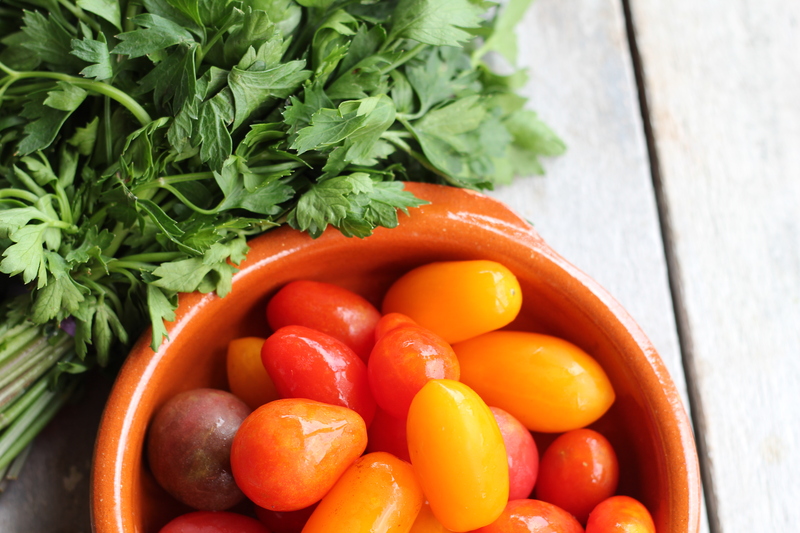 Halve the cherry tomatoes, finely chop the parsley and the mint, and add them all to the bourgal along with the cooled chickpeas and onion. To make the dressing combine the juice of 1 lemon, the olive oil, and the remaining teaspoon of ground cumin in a jar and whisk together. Pour over the tabbouleh and mix through. Serve at room temperature, with the pistachios roughly chopped and sprinkled over the top. This tabbouleh was amazing with the meatballs, carrots, and hummus, but the next day was just as delicious and filling as a lunch all on its own. 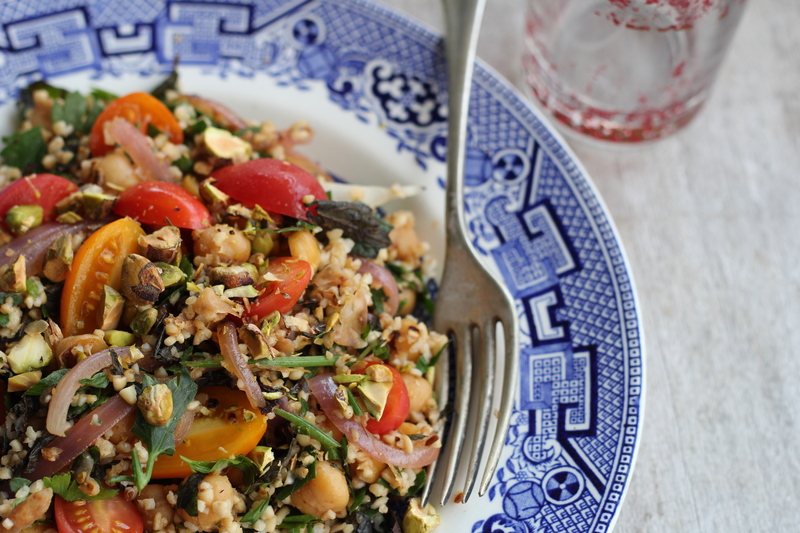 Notes: this salad is best fresh, but will keep for a few days in the fridge. The herbs will lose some of their green shine in the fridge, but will be just as tasty. If not eating immediately, keep the dressing separate until ready to serve. Looks delicious Ani! I love quinoa, so I’ll have to give it a go. Yum, this looks great and I love your pictures!